This is a tall coil pot with the collaged/sculpted features of an obscure Star Wars character. 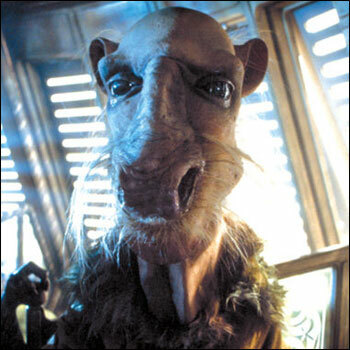 It's Saelt-Marae, also known as Yak Face, although he looks more like a camel than a yak. The character had about two seconds of screen time in Return of the Jedi. He had another scene in which he has a brawl with another rubber-mask character (the three-eyed goat-like creature Ree-Yees), but it was cut. The character gained infamy when its Kenner action figure was only produced in limited quantities and not released in the U.S. at all. Otherwise, he's just another ugly face in Jabba's palace. The Yak Face Pot is actually a vessel. It's food safe and theoretically microwave safe, dishwasher safe, and oven safe. It could be used as a chalice on some celebratory occasion.